Veteran writing program Co-Director Indigo Moor works with Emtt Hawkins, an Air Force veteran of the Korean War, to express his feelings about his experiences. Poet, screenwriter, and author Indigo Moore (standing) is Co-Director of a writing program for veterans. By helping them to remember their experiences and writing them down in free verse poetry form, the hope is that the exercise will help them confront the demons their war has left them to deal with. That concept is being applied to a small Sacramento area group of veterans of America’s wars. A writing workshop doubles as a support group to help each to offset the trauma of battle by giving them a way to confront the demons they continue to carry with them. Seated around a table in a quiet room in the library, five veterans gathered to write of their experiences among others who will understand what they have gone through. Local writer, poet, and CSUS and Sacramento City College English professor Bob Stanley is co-director of the group in the first of what will be four Wednesday evening sessions at the library. The remaining three sessions are: March 30th, April 20th, and May 18th. Veterans of all branches and all eras are welcome, even if they were not able to attend the first session. “The main focus of the group will be to get words down on paper,” Bob Stanley said. Any subject, any form. No rules or pressure came with the exercise. Each was encouraged to express what they feel and put it in words. Co-Director Indigo Moor is a poet, screenwriter, and author as well as a U.S. Navy veteran of Desert Storm. Moor read from the published works of several war veterans who had poured out their feelings as free verse poetry. One of those works was a poignant retelling of the poet’s visit to the Vietnam War Memorial in Washington, D.C.
Judging from the reaction of those present, the words were resonating with them as well. Another author wrote obscurely of things he heard, saw, and felt on a night patrol in Vietnam, but which each of the veterans present easily interpreted as a soldier waiting for the enemy to come at him from the darkness. Not knowing was as damaging to the psyche as combat itself. At one point Moor asked those present to close their eyes and envision that “one moment that defines the [war] experience” for them. He urged the men to use the sights and sounds of their experiences in the writing exercise, “use the senses that keep us interested,” he said. Rather than a blow-by-blow account of what happened, he asked that they call upon their feelings and condense them onto paper. Some who attended are still burdened by what happened to them in their war. 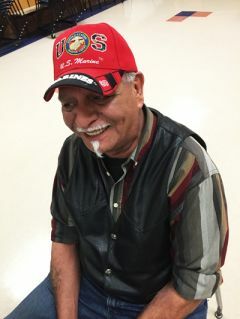 U.S. Marine Corps veteran Daniel Gomez served four tours in Vietnam. Gomez was wounded twice and continues to suffer the health effects of the injuries, exposure to Agent Orange defoliant, and malaria. When asked why he was attending the workshop, he said, “To figure out why the hell I’m still here.” His war may have ended four decades ago, but it is still as fresh in his mind as yesterday. The five men who attended the gathering represented different branches of the service: Army, Marine Corps, Navy, and Air Force, as well as different wars: Korea, Vietnam, and the Middle East. Carmichael resident Bob Pacholik is an author of some renown. He was a U.S. Army combat photographer in Vietnam during the Tet Offensive. His book “Night Flares: Six Tales of the Vietnam War,” chronicles the war and honors the men and women who served in it. Most of those present were there for the therapeutic value writing might offer. Some of the men said they hoped to continue to write beyond the program. Emmett Hawkins served in the U.S. Air Force in Korea. Among other subjects he is interested in religion and history. For each of the veterans who took part in the Rancho Cordova writing workshop, the object was to reduce their experience down to its essence to help them to better understand what happened to them. Poetry: a large idea, written small. For additional information about the veterans writing project, check out www.saclibrary.org and click on “events.” Also, the library information line number is (916) 264-2920.